Spring is in full flow and you know what that means – a plethora of CS: GO tournaments available to watch and bet on! Even though there are several big names coming up in the next week or two, there are none that leave the mark like DreamHack Open series. This time around, we are returning to DreamHack Open Austin 2018, where 8 teams will battle for whopping $100,000 total prize pool money. If that's not a good motivation, then pride and honor definitely are – and that's all it takes for all these teams to step it up a notch. With all that taken into account, let's jump straight to the fact and see what kind of action can we expect in terms of DreamHack Open Austin 2018 betting odds and tournament facts! The format of DreamHack Open Austin remains the same as with all other recent tournaments in the DreamHack Open series. This means that the teams will be divided into 2 groups in which the games will be played in the double-elimination format. Keep in mind though – opening and winners matches are Bo1 while elimination and decided matches are all Bo3. With all that in mind, only 4 teams will go through to the semifinals which are all played in Bo3 fashion together with the grand finals. There are just several days left to go before the official start of DreamHack Open August 2018, so it's no wonder eSports betting websites are already well prepared. 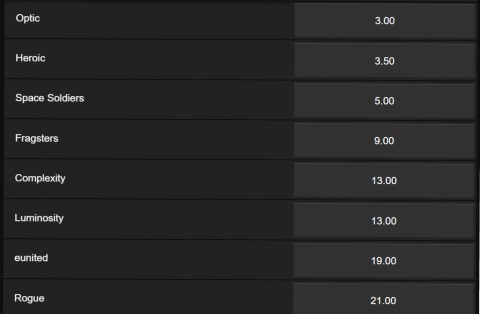 As always, you can find detailed DreamHack Open Austin 2018 betting odds from several most popular eSports bookies down below. Needless to say, all odds are pretty similar, but if you already have your mind set on something to bet on, I'm sure the charts below will help you choose which website to bet on.